And you think you get difficult email. 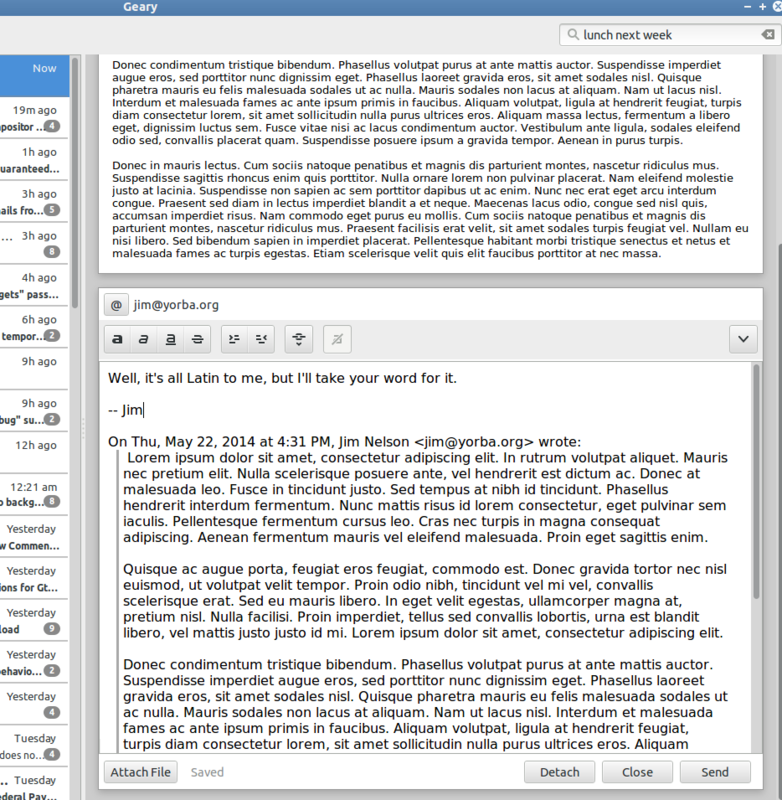 A year in the making, I’m pleased to announce that we’ve landed a major new feature in Geary: an inline email composer. What’s that mean? In short, when you go to reply to a conversation, instead of a new window popping up on the screen, the composer is embedded in the window right below the message you’re replying to. Want a separate window? Just press the Detach button and you’re writing emails just like Geary used to work. Old School, as the kids say. This great addition to Geary is thanks to the hard and tireless work of Robert Schroll who put this together on a private branch and has been maintaining it for some time now. Serendipity led Robert to San Francisco last week, and he generously spent a good chunk of his time here working with me to finalize snapping the pieces of the puzzle together and polishing the chrome. It’s pretty sweet, I must say. The inline composer is only available in git master at the moment. It’ll be available for general release in our next stable version, Geary 0.8. In the meantime, if you’re so bold and want to give it a test drive, you can build Geary from master. Or, if you’re running Ubuntu, install it from Yorba’s Daily Build PPA (but be sure to read the warnings on that page!) The more eyeballs the better. If you find a bug, please let us know.